Previous postmy shot for the week! oh! I absolutely adore Hermann Hesse! He is one of my favorite authors. Demian definitely left me thinking. All the books i’ve read from this author leave me deeply thinking about the meaning of life and self. When i read Demian,I thought an analytic philosopher would be somewhat less sympathetic towards psychoanalysis. Turns out, Demian is essentially serving as Sinclair’s psychoanalyst, uncovering what lies hidden in the depths of Sinclair’s being. This is towards the end of the book, Demian comes to sinclair to tell him that he will won’t be able to help him anymore (physically). I chose this quote, because this’ what marks Sinclairs independence. Before, when he was emotionally and intelectualy ready to break free, he didn’t. He still hung out with Frau Eva and Demian. Now, he is PHYSICALLY alone. The notion of him being seperated from Demian physically, shows the confidence demian has in Sinclair. Sinclair is ready to face the world alone. Though Demian may not be there in the flesh, Sinclair will be capable of doing anything Demian could—if he looks deep enough within himself =) and that’s why i like that quote. I very much enjoyed reading Demian, i remember it was assigned to us last year in Lit class and i wasn’t very enthusiastic about it, but once i’ve started reading Demian, i literally couldn’t put the book down, becuase Demian is written so affectionately. I appreciate Hermann Hesse’s work, he obviously put his all into it. i have Steppenwolf and beneath the wheel for Hesse, i am currently reading the glass bead game. i haven’t bought Siddhartha yet,,but for sure it is in my reading list for the next month.. what else did u read for Hesse? Owww, Murtadha, thank you for even thanking me while you truly owe it to yourself–the thanx. You are just an avid and dedicated reader. When you explore the philosophy or subject matter of a book you fully engage with it and not fear the questions and challenges such engagement may pose. 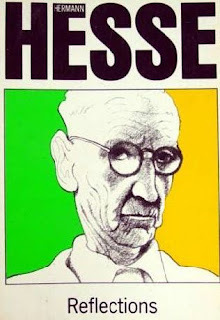 After reading your quotes and the titles of Hesse’s work you are currently reading, I feel a yearning to go to the library. After Taraweeh I will isa. glad to see you back, it seems you were too busy with new job 🙂 hope you are doing good in back home. i wanna know your new list of books,, because your books’ selection is always great. I’ve read Siddhartha, Demian, and Steppenwolf =) thats it. oh that sounds interesting what’s it about ? I haven’t gotten that far in the novel to know the story yet,,, but helpfully soon.. Absolutely, cannot choose, fascinating! Call me naive but I have never looked into any of Hermann Hesse’s work but that is sure to change now, thank you for introducing me to this man!